This 390 Square feet room with valuted cielings on the second level has a king bed, luxury twin hide-a bed and sitting area. 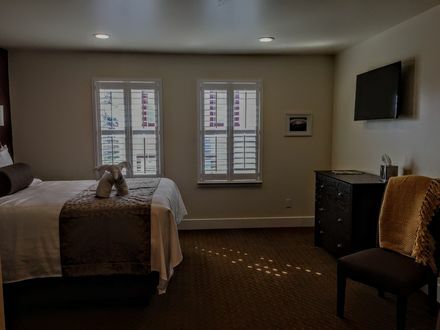 Luxury linens, hair dryer, plush robes, eco friendly soap and shampoo, large screen smart tv, complimentary WIFI, in room coffee & tea service, continential breakfast, overlooking quiet Main Street and nightly wine and appetizer hour. All rooms are non-smoking. These 350 Square feet rooms have a luxury twin hide-a bed and sitting area. Luxury linens, hair dryer, plush robes, eco friendly soap and shampoo, large screen smart tv, complimentary WIFI, in room coffee & tea service, continential breakfast and nightly wine and appetizer hour. All rooms are non-smoking. These large suites boasts a separate bedroom & living room with luxury twin hide-a-bed. Jetted tub with heater booster to keep your bath warm for as long as you like. Luxury linens, plush robes, hair dryer, eco friendly soap and shampoo, large screen tv's, complimentary WIFI, in room coffee & tea service, continential breakfast and nightly wine and appetizer hour. Some of the suites have a private balcony patio. All rooms are non-smoking. This 290 Square foot room on the second level has a queen bed. Luxury linens, hair dryer, plush robes, eco friendly soap and shampoo, large screen tv, complimentary WIFI, in room coffee & tea service, continential breakfast and nightly wine and appetizer hour. All rooms are non-smoking. Room with two queen luxury beds. Luxury linens, plush robes, hair dryer, eco friendly soap and shampoo, large screen smart tv, complimentary WIFI, in room coffee & tea service, continential breakfast and nightly wine and appetizer hour. All rooms are non-smoking. Located on the 2nd floor, this King room is a cozy hideaway. At 250 square feet this rooms is one of our smallest and great things come in small packages. Lots of great natural light. Sitting area, in room refrigerator, coffee, tea, snacks and drinks. Complimentary WIFI. Flat Screen TV with streaming abilities. Spacious bathroom with large shower.